Tenerife is the largest and the most striking of the Canary Islands and with it attracting more than 10 million visitors every year, it is one of the most popular too. Despite Tenerife having lots to offer with its unique blend of wilderness and lively towns, it is still very much an underrated cruise destination. 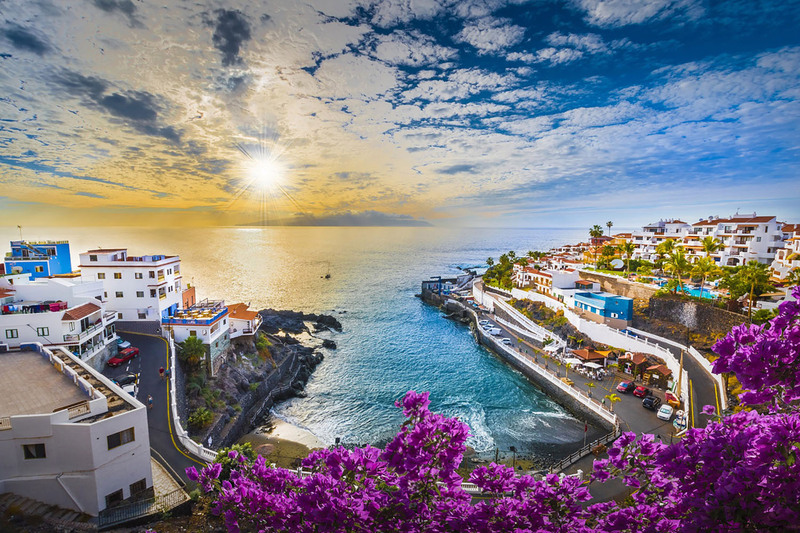 However, you can go on our Canary Island cruises and enjoy everything this gem of an island has to offer and here we take you through some of the reasons why Tenerife should be next on your cruise bucket list. Where should you visit and what should you do? With so much to see and do in Tenerife it can be hard to decide what you want to do with your time on land, but to give you a helping hand we have listed some of the places you need to visit. Teide National Park is the Canary Islands biggest park and it is not only home to craters, volcanoes and rivers of lava, it is also home to Mount Teide, which is Spain’s tallest mountain. Carmen Edelson, the founder of travel blog Carmen’s Luxury Travel, recommends you head here during your cruise holiday to Tenerife. Mount Teide is a volcano that stands at 3,718 m above sea level and with its unrivalled panoramic views and its changing looks throughout the different seasons of the year (during winter it can be covered in snow) will make it a source of delight for you. There are tours you can go on to discover this incredible natural attraction such as our very own Canadas Del Teide Panorama trip. This four-hour tour travels through the pine forests leading up to Mount Teide and lets you stroll through the lava fields. Many of you undoubtedly have heard of Los Gigantes, which is located on the sunny, west coast of the island. It is one of the most attractive natural wonders on the island with the area boasting cliffs of up to 800 metres that drop almost vertically into the sea. Pauline, who was born and raised in Luxembourg, writes about her travel adventures on her site Paulina on the Road and she says you just have to visit the village of Masca and Los Gigantes. With so many great attractions to visit and activities to try Monica from the travel site Not A Nomad Blog says you need to make the most of your time on the island by not just staying in one place. During your cruise to Tenerife, you can book to go on our Icod, Garachico & La Laguna tour. Here you’ll embark on a guided tour of the old-world architecture and rustic charm of the island that will see you visit some small towns and the former capital of the island, La Laguna. In total, this tour will take 7 hours. Tenerife’s waters are home to a whole host of fascinating marine animals, while on land you can spot some tropical birds. Bottlenose dolphins, loggerhead sea turtles, pilot whales and sperm whales are commonly seen in the waters around the island. Keen birdwatchers will also have lots of species you can see such as buzzards, egrets, herons, the blue chaffinch, parrots and Cory’s shearwaters to name a few. There are lots of wildlife excursion you can enjoy during your time in Tenerife and if you want to see orcas and other beautiful animals up-close, Victor Tribunsky, who shared his trip to Tenerife on the Victor Travel Blog, recommends heading to Loro Parque. Loro Parque is home to lots of other animals including chimps, hippos, lions, tigers, red pandas, gorillas, alligators and tortoises. The island is a sun seekers paradise as there are a plethora of world-class beaches you can lounge on during your stopover on the island. Many of Tenerife’s beaches have been awarded blue flag status, which is an award given out to beaches that fulfil the minimum requirement to satisfy visitors such as cleanliness and infrastructure. Playa de las Teresitas – the golden sand that makes up this beach near the capital of Santa Cruz de Tenerife was imported from the Sahara. The artificial reef also makes it a perfect location to go snorkelling as shoals of fish frequently visit it. Playa de las Americas – the most famous of Tenerife’s beaches due to it being located in the party capital of the island, its golden sand and calm waters make it ideal for bathing. Playa Del Duque – this beach is Costa Adeje’s most popular beach as exclusive resorts and high-end boutiques flank this trendy beach. The clear waters and cleanliness are just some of the reasons why this beach has been awarded a Blue Flag. Tenerife is a mecca for water sports enthusiasts as not only does it offer sunshine and beaches, it offers water-based activities all year round. This can be put down to the fact the ocean temperature remains warm from January to December (around 19C to 26C). If you are interested in renting a jet ski or would like to find out more about some of the other water-based activities you can try, check out the Water Sports Tenerife site for prices. There’s a reason why millions of Brits head back to Tenerife year-after-year and here we asked some travellers who have visited the island to tell us why they love it. As we’ve already touched on, Tenerife might be a small island, but it is home to a great mix of stunning natural beauty and thriving seaside towns. Monica from Not A Nomad blog also loves the fact that Tenerife is full of things to do and that there is something for everybody. “What I love most about Tenerife is that there is something for everybody, that no matter what kind of trip you are looking to craft for yourself, you can find a slice of that in Tenerife. For example, if you are an outdoorsy type of person, you are in luck -- there are laurel forests, gorgeous hikes, and an incredible diversity of landscapes. Do you prefer to just relax and treat yourself? Well, there is also an unlimited supply of space on the beach and great weather year round. If food and culture is your thing (I'm in this camp), then you’ll find no shortage of those things in Tenerife either. So it’s hard to go wrong when you have somewhere so diverse at your fingertips. Another couple of great aspects about visiting Tenerife on a cruise are the locals and their food. Canary Islanders are renowned for their warm welcomes, while the local food varies from potatoes to wine! There is so much to do in Tenerife with the island full of history, incredible beaches and wildlife. So if you want to experience a trip of a lifetime, then you should take a look at our Canary Island cruises and voyages. Image Credit: Bertrand Borie, Guillaume LORAIN.